It’s a cold almost-November day, 40 deg and raining, and everywhere I looked this morning, there were photographers, with their big cameras on tripods set up next to the road, wearing their rain gear and happily snapping away. Serious photographers are a unique bunch here – it’s like they bloom when the skies turns dark and cloudy, the rain starts to fall, and other people are grousing about the awful weather. But it’s easy to understand why. The clouds and fog skirting the big cliffs make them seem that much more majestic and mysterious. And no one, not even Ansel Adams, has seen just exactly this play between the clouds and the light. Heaven. My own morning’s photographic exploits were more modest, and more furtive. 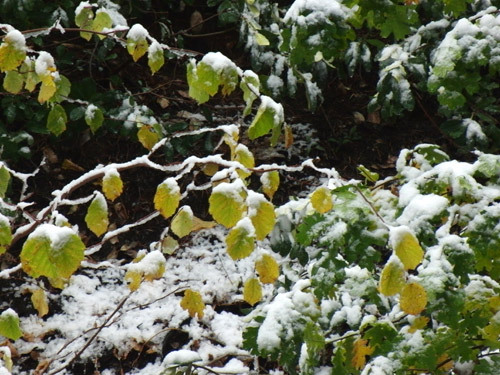 There was a tiny dusting of snow at the top of our neighborhood this morning, hanging in the changing leaves along the side of the road, and I stopped to snap a photo out of my car window. (The visitors might stop randomly in the middle of the road for deer or bear, but me, I stopped for a couple of snowflakes. I need to remember to be more patient when others see something photogenic. But, for the record, I did check behind me to make sure I wasn’t on a blind corner, took only 2 quick snapshots and was moving again before anyone else came up behind me.) Snow on the ground. Ski season is coming up fast. Over breakfast, I read Tom’s copy of TUNA News, by a nordic ski group out of Utah. Lord knows why we get their publication – something Tom did at some point. There is new ski gear in the catalogs we receive daily in the mail, and I’m contemplating new AT boots to go with the big plans I’m making for this ski season. 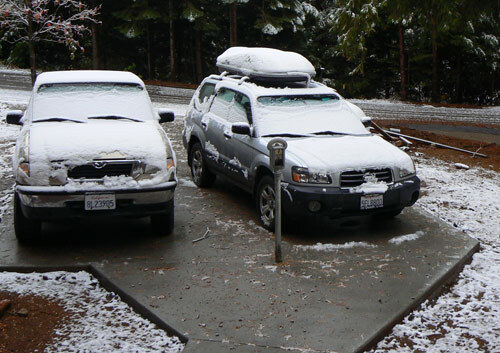 I’m always excited about snow, but this year I’m preparing for long weekends in the high country, in Tahoe, or if I’m really ambitious, over on the East Side. October 22nd was my 4th Boulder Day, and it seems like a long time, but I finally feel like I’m in the position to get back into ski shape. The first few years after the boulder event, I just didn’t feel like I could take the pounding, and last year there were so many house projects that we didn’t seem to be able to find the time. This year, everything is coming together. I’m now on day 20 of my new fitness program, and already starting to see some results. I’ve lost some weight overall – just a couple of pounds – but between fat loss and muscle gain, I can see some significant differences in the way that my body looks, and those pants that were getting too small are starting to feel comfortable again. Most importantly, I’m feeling stronger than I have in a long time. Years. Long enough that I’d forgotten what it was like, and what it’s like, is good. The program I’m on is only 30 days long, and so I’m shopping for a new program. I checked out the Mountain Athlete program because, that seems pretty sport-specific. Lots of functional movement and sport-specific exercise. Tom mentioned a guy named Eric Cressey who is well-known for building strength. Tom also thinks that between us, we know enough that I could probably design something good for me without spending a bunch of money – which is certainly true – but for some reason, I work out a lot harder when I’m on someone else’s program. So, I’m still shopping (and taking recommendations if anyone has them), but committed to finding something in the next few weeks. A serious program might have to wait until after our vacation to Hawaii though. Can you believe it? After years of planning mountain vacations and family vacations, Tom and I are finally headed to the beach, just the two of us. Running on the beach, surfing?, hiking near Haleakala, exploring the Road to Hana, resting, reading, and relaxing. I’m looking forward to the change of pace. The other new season that is just around the corner is NaNoWriMo. Last year, not only did I finish the challenge of writing 50K words during the month, not only did I enjoy spending hours typing up a story that no one will ever read, I also managed to learn something in the process. Naturally, I’m excited to do it again this year. November is only two days away. Lots of new things starting for me. New season. New fitness level. New commitment to play. New exercise program. New NaNoWriMo challenge. Life is good. It was the strangest thing, and has been quietly haunting me ever since it happened. We were on our way out the door to surprise a friend on his birthday, saying goodbye to a guest who had spent the night and was now on his way to Colorado, by bicycle. 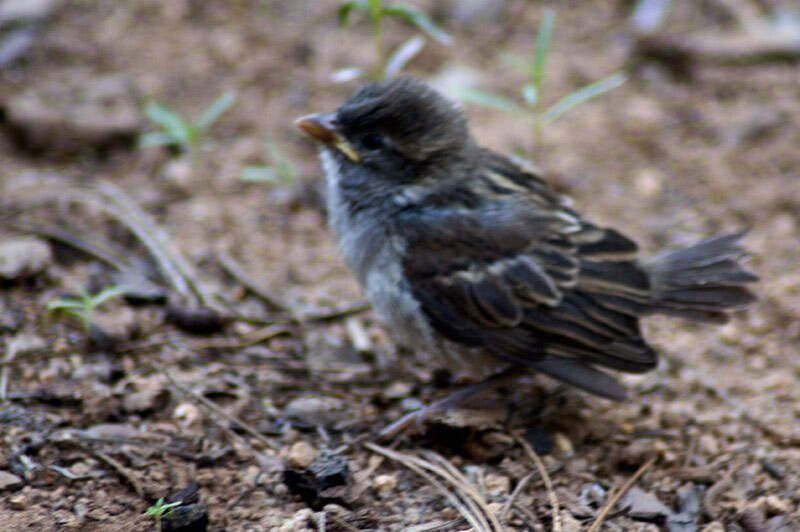 Tom had taken the first load of things out to the car, when he called me, and pointed out a small baby bird, still slightly downy, hopping and cheeping on our walkway. It didn’t seem able to fly yet, and could only manage a few feet in a flutter. That was interesting, and I thought maybe I’d go out and take a picture. 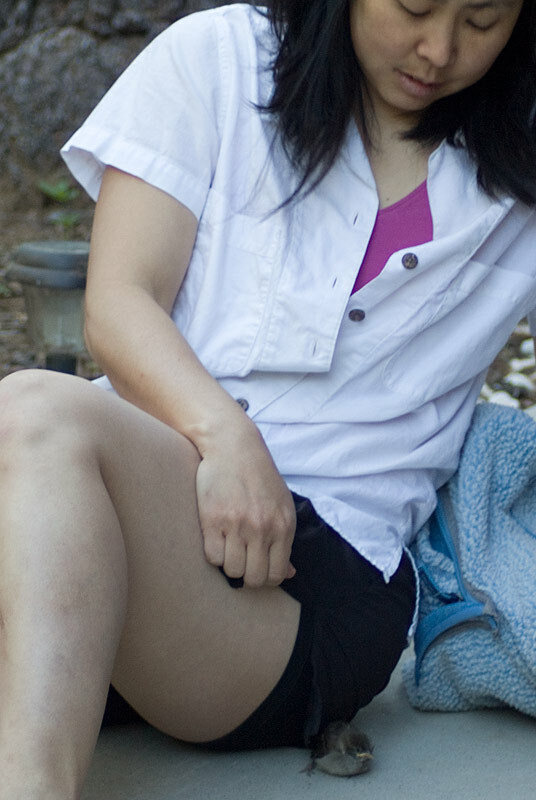 I sat down on the sidewalk, and started taking pictures, and the little guy (girl?) started hopping toward me. I held still, delighted to be getting a close-up view, and trying not to frighten it away. I shouldn’t have worried about that. It hopped straight up to me, and cuddled in next to my leg. When I moved away, it followed me and settled in again. It seemed cold (in spite of the down coat? ), and desperately cute. The baby bird hopped right up to me and snuggled in for warmth. The only explanation for this one being out on its own, that I could think of, was that he’d been kicked out of his nest by a stronger sibling or something, and left without help from his parents, hopping and peeping as it was, it was probably going to end up as a coyote snack, if it didn’t die of exposure or starvation first. Normally, I can be fairly stoic when it comes to natural selection. In nature, sometimes even the really cute little guys get killed and eaten, but then the cute little guys rarely make a personal plea. They rarely come right up and ask for a little warmth. It had snuggled up to me. It had started a Relationship. I know nothing about how to care for a young bird. I didn’t know what kind of bird it was, or what it would normally eat. If we fed it, would it still learn to forage for itself eventually? Even more of an issue, we were leaving for a 3 day weekend in San Diego. We couldn’t take it with us, or care for it while it was here. so, we settled for leaving an old fleece jacket on the sidewalk with the little bird, and continued packing the car. Almost immediately, the bird settled into the jacket and I was able to pick up jacket and bird and move it to a more sheltered location. Then we left. Tom wondered aloud whether we’d really done it a favor or not. Starving to death doesn’t sound like a good way to go. Maybe it would have been better for it to have been left more exposed, to die more quickly from a predator. We’ll never know. When we got back, the little bird was gone. I learned later, that sometimes when a young bird is first learning to fly, it spends some time hopping and flapping furtively on the ground, with the mother bird nearby, before getting itself straightened out and getting on with its life. I choose to believe that is what happened to my little bird. 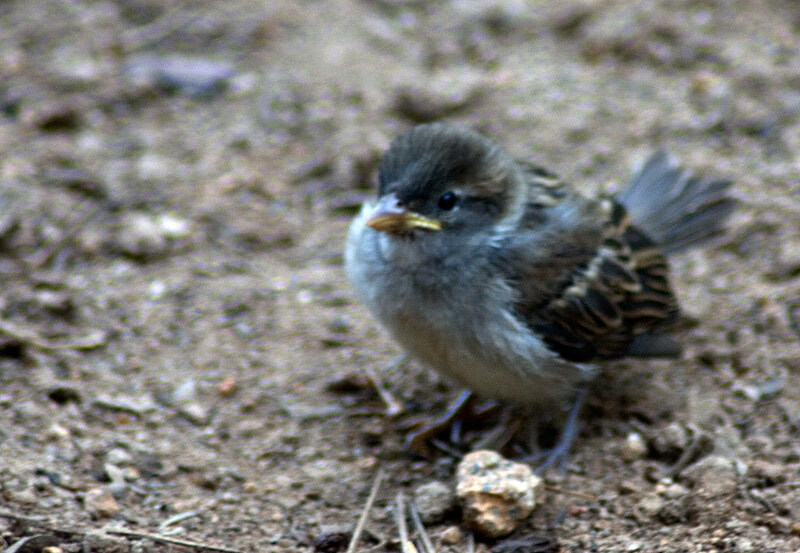 Of all the birds in Yosemite, this little brown bird is my new favorite kind of bird… or would be if someone can tell me what kind of bird it is. The last few weeks have been all about working and trying to get the downstairs apartment ready for the renters who are arriving June 1. Fortunately, a few days ago we had a brief power outage – just a few hours in the evening, which gave me an excuse to do a bit of sketching. Copied this pic off the front of a Rotarian magazine (Tom and I are both proud members) by candlelight that evening. Our Yosemite Rental House and etc. The steady churning of projects surrounding our new Yosemite vacation rental increased to a frenzy starting late May into early April. We have a nice stream of renters from VRBO who are planning to stay in our downstairs apartment starting on June 1, and the pressure to have everything in order by then is intense. In addition to the furniture purchases we’ve made online, in the last two weeks we’ve made, collectively, 3 completely separate trips into Fresno for furniture and other finishing supplies for the house. We’ve bought a brown leather sofa for the living room, new comforters, sheets and bedding for the bedroom and the living room daybed that we ordered online, a sharp-looking 42″ TV, TV stand, rugs, blinds, and a multitude of other home supplies like kitchen gadgets, pots and pans. The friendly cashier at Lowe’s mentioned today that he recognized us from the previous times we’ve been in the store. We’d be a lot happier about that if we didn’t spend so much money every time we went in. The building phase is finished. We passed our final building inspection a week ago on Friday, but we’ve hired the Roosevelt Cooks (that’s plural, Sr. and Jr.) to help us pour a separate parking pad and walkway, so that our renters will have their own space when they drive up. They framed it up in just half a day, it looks great, and now are getting ready to pour just as soon as the weather cooperates. I love hiring professionals. We’ve also started thinking of the front yard area, and what we can do there that will be beautiful, but wild and un-manicured at the same time. We bought some Sierra wildflower seeds at a local nursery, and I hope that the yard area turns into a wild garden of color when the weather warms up. We’ve had some blissfully warm days, but just tonight there was snow again, and the Dogwoods in the yard still haven’t been persuaded to bud and bloom. This is a long winter year, and the snow is lingering. Still, it’s coming together so fast. I’ve finished the first week of a new weightlifting/fitness program, and am looking forward to decreased soreness in week 2. The first week, the bicep curls left me unable to straighten my arms, and after the leg work out, I now groan and stretch my protesting calves into a standing position in the morning before taking the first my first tottering steps. Truthfully, it feels fantastic because it feels like I’m getting stronger. Tom says that there is already some visible difference in my upper arms. My biceps are back. I’m not completely sure that I believe him, but the positive reinforcement is welcome anyway. Tom also tells me that according to one of the fitness experts that he now follows regularly, sometimes the nutrition is the key to big breakthroughs. The expert himself is not a nutritionist, but he’s just noted over the years that often his athletes make a big jump in performance as soon as they get the diet part of the equation right. So, Tom’s concerned that the many handfuls of almonds I snack on pre-dinner, is not the winning strategy I’m looking for after all. The highly recommended 6 small meals a day (with an emphasis on protein) program is the hardest part of this fitness program for me. I’m going into week 2 with a renewed commitment. The frozen shoulder is thawing slowly, as it tries to keep up with the other exercise. I’m up to 160 degrees of passive flexion – the same as the active range of motion in my ‘healthy’ shoulder. Still, my external rotation still needs some work, and the left shoulder as a whole is still terribly weak, although between rehab exercises and my weight program, it seems to be getting stronger quickly. I’m looking forward to making a first stab at rock climbing again. I want to try my hand (my shoulder really) on an easy boulder problem that everyone has been recommending (everything from 5.2 to V4). It’s going to be a long time before I’m climbing as hard as I used to, but at this stage in the game, I’m just looking forward to being out on the warm granite pulling hard. Wouldn’t it be great if this summer was my summer to put all the things I’m interested in together? Backpacking, trail running, rock climbing, photography, playing the piano, art and the internet? Not to mention running a vacation rental and too many projects at work. There’s so much to do! Next week, our friends from Switzerland arrive for a few weeks of mountain adventure and exploration. It’s going to be so good to see them again, and to meet the littlest Longchamp, who I think is already 3 years old. It’s strange how time moves. It seems seems mostly to slide by unnoticed, except for the size and ages of our friend’s children. We had hoped that they would be the first guests in the new downstairs apartment, but there’s still too much to do to make them feel comfortable there, especially with a toddler. Instead, we’ll have a few more evenings of preparing, and then when more friends from the Bay Area arrive on Thursday, Tom and I are going to do the honors ourselves, and give the place it’s inaugural stay (if you don’t count the handful of people who crashed down there among the construction debris when it was still completely unfinished). It feels like we’re going on vacation, and I can hardly wait. Also, we’ll hopefully figure out if anything is missing before our renters arrive, so that everything will be ready for them when they come. Climbing The Nose & Dayhiking Whitney. The adventure week. There was a lot of adventure in our household the week of 9/9/09. We moved our stuff out of the crawlspace so that our new contractors would have some room to work on finishing out the downstairs unit in our house Saturday and Sunday. Tom climbed the Nose in a Day with Hans on Monday, and then we drove across to the East Side and hiked Mt. 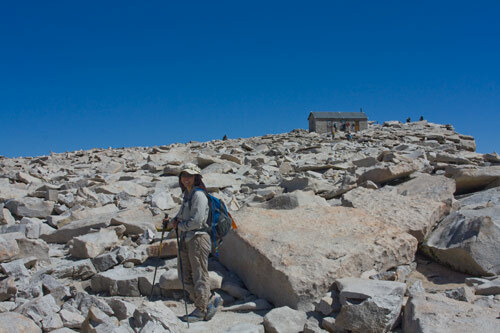 Whitney in a day on Wednesday, returning tired but happy to our little place in the Valley Thursday night. Although Tom and I spent today pretty much hunkered down with house work, we did manage to take advantage of the evening hours for a quick run and some spectacular scenery. We waited until after the heat of the day passed, around 5:30, packed up quickly, picked up our neighbor and headed out for a evening trail run that took us through lush meadows filled with wildflowers, and along the rim of Yosemite Valley. The Grouse Creek fire is burning pretty amazing right now. The plumes of smoke hang heavy over the valley, and I’ve seen some people talking online about making their trip elsewhere. Not that I blame them, but in the evening light – fires are amazing. First, during sunset, the sun set was almost blue and purple from being filtered through the smoke. It was SO much cooler than your average sunny day sunset in the Sierra. And then, after our run – on the drive back down Glacier Point we had to pull over multiple times because the flicker of flames in the forest next to the road was absolutely breath-taking. Towers of orange embers, leaping flames in the darkness, an orange glow putting the foreground trees into silhouettes. Magic, I tell you. Have I mentioned that the moon is almost full, too? Tuesday, I think. And we got to see a pair of Peregrin Falcons, the young one screaming out for a food exchange. If you’re coming to see the ‘classic views’, for sure the smoke gets in the way. But, if you keep your eyes open, there’s a special kind of beauty during burns. No pictures, because we were out for a run, but we’re going back up again tomorrow. Dinner on Sentinel Dome. Pictures. Um.. well we have sort of a house.